Two years ago I had a post titled "Avoiding recession is all that matters." The central point of the post: "When yields on risk-free assets are close to zero, it only makes sense to hold those assets if you need liquidity and/or are highly concerned about the potential for losses in other assets, most of which are yielding substantially more." That same advice still applies today. Cash only makes sense as an investment if you really believe we are headed for a recession. Otherwise you can earn substantially more on a variety of decent investment alternatives (see this post for a chart of the current yields on select investments). That so many people still cling to cash—retail bank savings deposits, which pay virtually nothing, now total $7.7 trillion, up from $4 trillion just five years ago—is evidence that lots of people are still very worried about a recession. The big news yet to come will be when millions of people holding trillions of cash decide it no longer makes sense to hold so much cash because they no longer worry about another recession. That's when the Fed will need to start tightening monetary policy big time. So far, there's still a healthy amount of skepticism out there, and the demand for money is still quite strong. The news of late continues to suggest that the economy is growing and that there is no recession on the horizon. We aren't seeing robust growth, but neither are we seeing any of the signs that ordinarily precede a recession. The yield curve is not inverted; the Fed is not tightening aggressively; real yields are very low or negative; and swap spreads are at normal levels. Today's release of the January ISM report on the service sector was unremarkable, except to the extent that it showed no sign of significant deterioration. 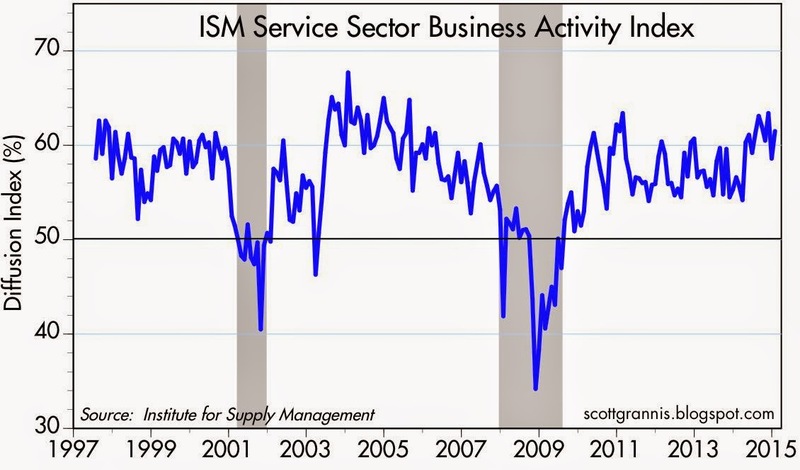 Indeed, the business activity index, shown above, registered a level that is reasonably strong. The non-manufacturing composite index, shown above in blue, also suggests that the service sector remains reasonably strong. 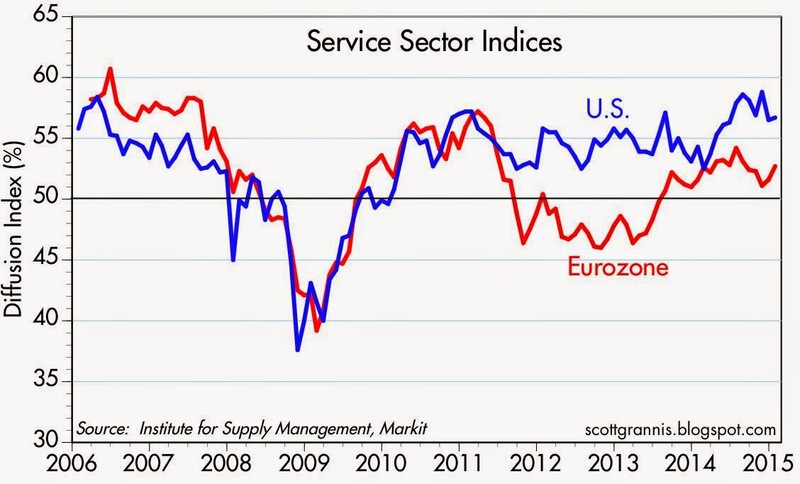 It's encouraging that the Eurozone service sector appears to be enjoying a bit of improvement after a multi-month slump. The above chart shows yet again that there is a lot of worrying going on out there, despite the evidence of continued economic growth and healthy corporate profits. The Vix index is still elevated, and 10-yr Treasury yields are still very low, and both are signs that the market worries about the economy's growth potential and worries that unpleasant things could lie in wait just around the corner. Great post. Except my first and last reaction to everything is to worry, a trait inherited from my parents. "On Wednesday, Finland became the first nation in the region to pay a negative yield on five-year debt sold at auction, suggesting that investors are unperturbed by the country’s weak economic expansion and its dependence on troubled Eastern Europe. Finland’s exposure to Russia, both geographically and as an export partner, makes its government debt riskier than that of other countries, but this in turn demonstrates just how fierce the demand for eurozone government debt has become." NOTE: The ECB doesn't begin purchases of bonds until MARCH 1st!! IMHO, there is nothing about the global economy that is "normal". QE etc. has been going on so long in the US that it seems normal but it isn't. Interest rates near ZERO, QE & devaluing a state's currency are desperate acts!! It is all quite artificial. Let's not forget that. William: interesting news. Look for lower global interest rates...US lower too? Probably. The new normal is ZIRP? The new normal is negative interest rates? Maybe coming to a bank near you! "That's the warning today from McKinsey & Co.'s research division which estimates that since 2007, the IOUs of governments, companies, households and financial firms in 47 countries has grown by $57 trillion to $199 trillion, a rise equivalent to 17 percentage points of gross domestic product. McKinsey sees little reason to think the trajectory of rising leverage will change any time soon." William: First, are you the gentleman who was on margin for the whole run-up but then liquidated a good chunk a few months ago? If so, well done (even if we haven't come off that much recently). Question: You raise many worrisome points and I have a good deal of respect for what I think are your instincts. My question is: What do you invest in now? By implication from your posts, it would seem you don't like equities or bonds of any stripe. Yeah, that is correct, C'est mois! As I wrote I sold equities and thereby raised cash to 42%; the other 58% is in equities. 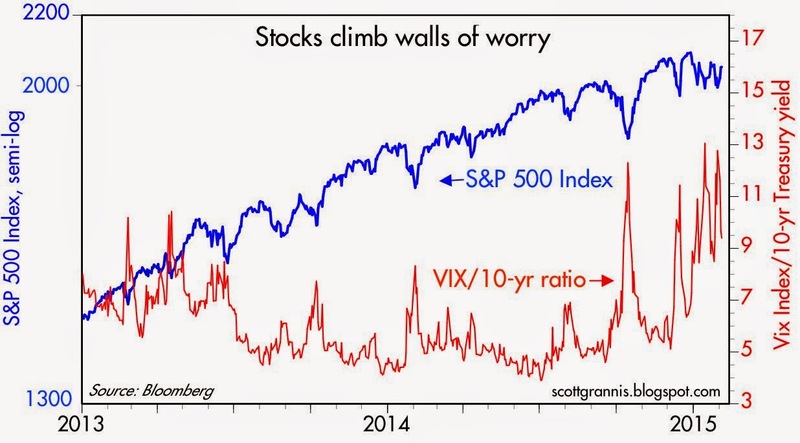 The "cash" is in a Vanguard money market fund earning nothing. I don't understand my "instinct" myself. But from 2010 to 2012 I kept buying the major corrections until I was 125% long. Then went off margin last April - May 2014; then raised the cash in October and November. Two things: 1) personally I prefer to bet against the crowd when it seems it and the pundits and even my friends are negative about equities and 2) I am not confident about how all the moving parts around the globe will play-out. I had expected Europe and Japan to be doing much better by now and for China to continue to grow 8 - 9% annually. Its seem to be that the optimism toward equities is based primarily upon: 1) "equities are the only place to put your money"; 2) stocks are in a "new era" of high profit margins that will continue; 3) that competitive currency devaluations will help Europe, Japan, etc. ; and 4) that American consumers will return to their borrow and spend ways and buy large quantities of foreign goods with their stronger dollars; and 5) a blind faith that Central Banks' desperate / untested measures will save the day. I think there are reasons to doubt all five points. For example, Japan imports 50% of its food and much of its basic raw materials. A Yen devalued by 30+ % makes those items much more expensive. If - due to the lower price of natural resources including crude oil and the devaluation of many foreign currencies - the US CPI were to fall by 1.5% in 2015, the purchasing power of one's cash would increase by 1.5% even if the money market fund paid nothing. In a falling inflation environment, CASH can be KING especially if bond and equity prices fall !! Here is the link to the summary of the McKinsey report. Yet if, as it appears, economies need ever-larger amounts of debt to grow, and deleveraging is rare and increasingly difficult, they may also need to learn to live more safely with high debt. Me: all that debt money in the world has to be managed or there will be problems.